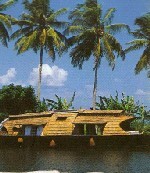 Kerala destination Kottayam is called the “Land of Lakes, Latex and Letters”. The country’s first printing press in vernacular (Malayalam) was established here in 1820. This land of letters has the highest literate district in the country. Many newspapers, magazines and periodicals in Malayalam and English are published from here. The beautiful backwater town of Kottayam is on the foothills of the Western Ghats and is an important trading centre. It is also known for its religious harmony with numerous temples, churches and a 1000 year old mosque. Kumarakom – Located 15 kms from Kottayam town, this sub-tropical paradise on the banks of Vembanad lake is interspersed with enchanting waterways and canals. Adding to its beauty are the mangrove forests, lush paddy fields and coconut groves. You can enjoy here the traditional country crafts, boats and canoes floating leisurely on the backwaters, which is mesmerizing. Kumarakom Bird Sanctuary with Siberian crane, egrets, herons, teal and other exotic birds, is also located here. Many resorts offer facilities like Ayurvedic massage, yoga, meditation, boating and fishing etc. Vembanad Lake - The delightful lake is a prime picnic spot and backwater tourism destination. The famous Snake Boat Races are held here during the Onam festival. Adirumpuzha – Here is the famous St. Mary’s Church, built in 1080 AD. Aruvikkuzhi waterfalls - It is a beautiful spot for picnic located about 18kms from Kottayam town where streams tinkle as they make their way through the landscape and waters roar as they cascade down the mountains from a height of 100 feet. More Places to See in KottayamSt.Mary’s Church, Cheriyapally – This ancient Church, built by the Portuguese, has exquisite murals and paintings depicting Biblical and non-Biblical themes.St. Mary’s Church, Valiyapalli - This ancient Syrian Christian church atop a small hill, is said to have been built in 1550.Thazathangadi Juma Masjid – Located 4 kms from the town, this ancient mosque on the banks of Meeacil river. It is a magnificent mosque.Ettumanur – Located 12 kms from Kottayam, is the ancient Siva temple which is a masterpiece of the Kerala style of temple architecture.Vaikom, 40 kms away from Kottayam. The famous Siva Temple is believed to have been built by Lord Parasuram.